What does it look like when the first crew of a nuclear-powered fast attack submarine begins to come together? Here’s a glimpse. 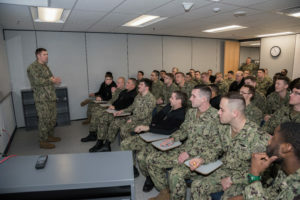 There are nearly one hundred young sailors training, qualifying, and building the initial culture of the team that will take the future USS MONTANA into the Navy fleet at the boat’s commissioning, probably in early 2021. These crew members come from 29 states – and they include two from Big Sky Country with another on the way. The officers and young sailors are taking their training and other duties extremely seriously. Many are earning new rank and awards. began with the Engineering Department that will operate the nuclear power plant of MONTANA and the related equipment and systems. 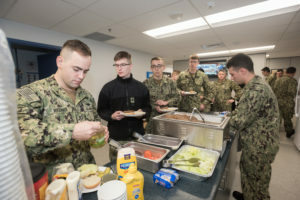 Most recently the “forward Sailors”, those responsible for things other than the power plant – everything from combat systems to navigation to medical and food service, have been coming aboard. All are proud to be “Vigilantes of the Deep”, preparing to be silently on-guard, ready in dangerous parts of the world to, if necessary, fulfill the motto on the USS MONTANA’s emblem: May it Defend our Way of Life. Being “aboard”, for now, means working, studying, and training in a building adjacent to the one in which MONTANA is being built. The boat (and we’ll explain the history and meaning of “boat” v. “ship” in a future blog item…) is about 60% completed at Huntington Ingalls Newport News Shipbuilding in Virginia. This year is one of critical milestones in PCU (for Pre-Commissioning Unit) MONTANA SSN 794’s evolution toward commissioning. The importance of this milestone cannot be over-stated. It means that the crew will be verifying the integrity of every mechanical system that is connected to the reactor plant in preparation for it to eventually be activated and then operate for three decades – always under the expert and watchful eyes of highly skilled and trained Engineering Department personnel. 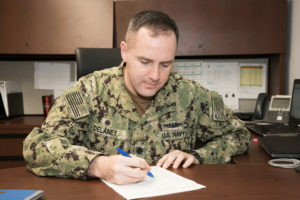 All this takes place as the building of the crew and its culture continue under the boat’s leadership triad, the CO, Executive Officer and Chief of the Boat. 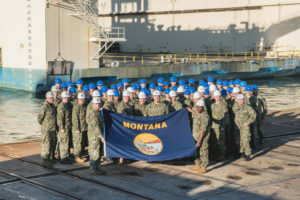 In Big Sky Country, Montanans are watching the future USS MONTANA’s progress with keen interest. 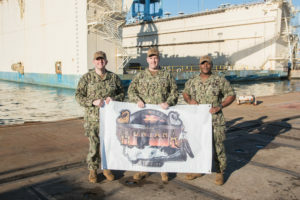 They are supporting and becoming involved with the USS Montana Committee and its work in support of the commissioning and crew of SSN 794. And they are eagerly awaiting opportunities to meet some of the MONTANA’s first crew members who will spend time in Montana next summer. 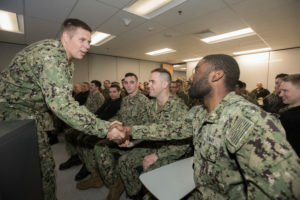 Small groups of sailors will visit various areas at various times to get to know Montana and her people, to do volunteer service projects, and to learn about Treasure State history and culture. If you would like to volunteer to help with the crew visits to Montana, just send a note though the contact page of this website and we’ll connect you with a Committee Steering Group member from your area.